It crashed to the floor, breaking into an explosion of pieces. Beyond repair. My favorite mug, now being swept into the trash. “Should have been more careful,” I mumbled to myself. In the midst of the hurried cleaning frenzy, I’d lost my grip. So telling of real life. “Just glue it back Mom,” my kids said. But it would never be the same. The damage was done. Broken things. Very familiar to a family of 5, with 4 pets. Lots of things moving around and active in our house. And if certain broken pieces are able to be fixed, they normally find a temporary home on the shelf, awaiting the super glue repairs. Or maybe just tossed away if unable to be neatly pieced back together and strategically repaired without hint of a patchwork of super glue lines. Often, it takes too much work to fix what is broken. It’s easier to just buy a new one. Ever feel that way? Broken. Shattered. Set on a shelf. Tossed aside. Or thrown away. It takes too much work to try to restore. “Just get a new one,” the mindset of our culture whispers our way. “Don’t let anyone see the broken flaws.” Such reality in the way we often live in this world. In Japan, they’ve made an art out of restoring broken things. An ancient practice called Kintsugi, meaning “golden joinery” or “to patch with gold,” is an age-old custom of repairing cracked pottery with real gold, not only fixing the break, but greatly increasing the value of the piece. The heart of it all – turning what is broken into beautiful, cherished pieces, by sealing the cracks and crevices with lines of fine gold. 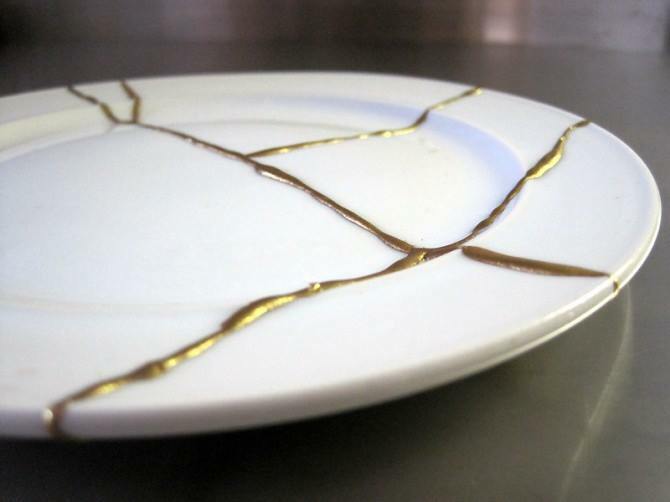 Instead of hiding the flaws, Kintsugi artists highlight them, creating a whole new design and bringing unique beauty to the original piece. The pottery actually becomes more beautiful and valuable in the restoration process because, though it was once broken, it not only has history, but a new story. Better than new. Soak that in for a moment. There are lies out there that swirl around and whisper to your deepest soul in weak moments, when you’ve lost your grip, and things come crashing down. You feel the need to hide the scars. You feel like the brokenness has rendered you useless in life. You feel beyond repair this time. You feel tossed aside. Forgotten. Shamed. Rejected. As you sit on a shelf. Yet God breaks through all that mess. You are never beyond healing. You are never too broken for restoration. You are never too shattered for repair. Do not be ashamed of your scars, of the deep crevices that line your soul, or the broken places of your life. They have an amazing story to tell. Here is truth. Just because we’ve been broken doesn’t mean that we are thrown away. Just because we’ve been broken doesn’t mean that we are un-usable, set up on a shelf. Just because we’ve been broken doesn’t mean that we are forgotten. Brokenness has the power, unlike anything else, to bring forth new beauty, strength, and inspiration to others. Because it’s often in those moments that we’ve tasted deep suffering, that we noticed, we were made for more. There’s more. There’s purpose. The scars of life, the healed wounds, the deep lines, they all have stories to tell. Yet often we try to hide them away, preferring instead to present to the world, a safe façade of who we are, a more “perfect” version. It’s too difficult to risk the real vulnerability of exposing what once was. Or what still is. We have a Healer. One who repairs. Who can fit the broken pieces that no longer seem to fit right into a perfect design. He works, often behind the scenes, mending, fitting together, creating a better work of art, more than we ever dreamed possible. He makes all things beautiful. Especially in the broken. All from his grace. It is real life. Jagged edges and all. They have such meaning. You are not just simply patched back together, as he secretly hopes the glue will stick this time. Your repair and healing is never intended to be invisible. But beautifully lined with shining grace through every scar and broken space. Gold filled crevices of our heart, now stronger, better, more beautiful than before. And that is what His story is really all about. Bringing life to what was broken. He was willing to take on the brokenness of the world in exchange for our freedom. Kintsugi–I had to look this technique up so I could visually appreciate this lesson. I love it! There is so much depth in this concept. We all are broken. Our awesome God takes our broken pieces and creates something beautiful, something better, something stronger . . . Glory! Hi Debbie, I love your blog. Ive one myself called http://www.sailingwithgod.com would love you too take the time to have a look a give me some feedback. Only just startedit up. I came across your page on Facebook then I googled you and found your blog ?? Thank you Debbie for your page. I was recently introduced to it. I look forward to reading more. God Bless you. What an Awesome post Debbie. I have experienced Brokenness many times. The most recent and most devastating being the death of my husband:(best friend, soulmate, Pastor, counselor, and so much more.) We met in high school. Age 14 & 16. Spent the rest of our life together until God took him home 3 years ago. My heart has become more tender during this time. God has walked with me during every step of my journey. My heart still aches & I know it always will until we are together again (in Heaven) But for now my heart desires to praise and worship my Savior. I surrender my life to be used by God to bring Him Glory. ? A wonderful post, you are blessed with a special gift. Having been broken more times than I care to remember. I had to pause, regroup and come back. I don’t really know if I came back stronger, but I know I came back wiser and more thoughtful. It is now who I’ve become, different, less trusting, more selective, perhaps a better judge of character with the knowledge I don’t have the time to waste on these people or institutions. As such I now have peace of mind. It took me a long time to get here, but I have arrived. Thank you Debbie your posts help keep me focused on the important things. Your ministry is a blessing to all who have found you.